Since the inception of Taco Trucks Columbus, we noticed recurring questions as posted comments on the site, when we speak to taco touristas at events and during interviews with the media. To save readers the hassle of searching through the comments for answers, the Taco Truck Columbus Team has compiled answers to our Frequently Asked Questions. If you don’t see the answer you are looking for – please post your question on this page. If you have a general question or comment about Taco Trucks in Columbus – please post here as well. Are Taco Trucks Vegetarian Friendly? Long Answer: It depends on the truck, sometimes the day and what your level of vegetarianism is. There are over 30 taco trucks representing different countries, regions and cooking styles. A few trucks are somewhat vegetarian friendly (we mention so in our posts when possible). You can get a quesadilla at almost all of the trucks. However, due to the small amount of cooking space in a truck it is unlikely the tortilla and cheese did not come into contact with some meat tinged grease. One can order a quesadilla anywhere so that is not the point of going to a Taco Truck. Rice and beans is sometimes an option – however, the beans are usually cooked with lard or pork. Taco Trucks often represent the comfort food of the place the owners are from. Let’s face it, there just is not a lot of vegetarian comfort food. Your better bets are: The 8th Taste: Apreas with cheese and maybe empanadas; El Manantial Latino: empanadas; Los Potosinos: will make some vegetarian options on request; Junior’s, being in Victorian Village, often gets requests for meat-free food and offers vegetarians burritos (and perhaps more). I can not find the ___(fill in the blank)__ Taco Truck or can’t tell if it is open. Taco Trucks are mobile. Some close up shop in the evening and drive home for the night. Some move to a new location without telling us (Juniors has the record for the most moves in one week). Some disappear, La Vacana – donde esta? Some change the day they are closed on a whim. One truck is weekends only and another opens at 4 PM. And sometimes the owner may be sick, has a family emergency, or just opts to close the doors for a day. If you speak Spanish – call ahead for hours and days of operation. Many trucks close for the winter or change their hours depending on the temperature of the day. We keep information as up to date as possible however there are more Taco Trucks than Taco Trucks Team members so the trucks have the edge. We do have a category called Ghost Trucks for Taco Trucks that have gone on extended hiatus. We also have a category for Closed trucks that are gone and never coming back. When possible we make updates on each truck’s post as well as the List of Taco Trucks and the Taco Truck Map. You can also help us by posting updates as comments for a truck. Are Taco Trucks safe and clean? 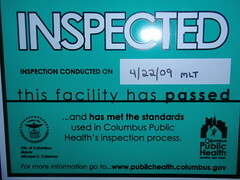 Taco Trucks are inspected by the Columbus Board of Health. Each truck should display a green Columbus Health Department Color Coded Inspection Sign with the date of the last inspection. Inspections occur at least once per year, just like any restaurant or food supplier. Taco Truck owners must have a peddlers license as well. A yellow health department tag means the truck has been warned about a health code issue and is on probation while they implement recommended changes – so menu items may be limited. A red sticker indicates a major health code violation and the business is closed. That being said, mobile food vendors, including taco trucks, can get a bad rap. Hot dog carts and hamburger stands fought these same stereotypes in the 20th century as they evolved into American icons. How many restaurant kitchens have you seen? This writer has seen some very scary kitchens behind closed doors. Taco trucks are open kitchens – customers can see every step in the preparation process for start to serving time. If you are wary of a truck – order one taco – watch how it is prepared. If something gives you the creeps – pay your $1.25, cut your losses and move on to the next truck. The owner of the truck is often the one cooking your food. He or she depends on repeat business to stay in business and cleanliness is the key to happy customers and health inspectors. The inspectors make regular spot checks on taco trucks just as they do for restaurants, grocery stores, fair food stands and elsewhere. So the answer is: taco trucks are as clean as any other food you eat and in this case – at least you can see it before you eat it. We think that is a very good thing. I want to rent a Taco Truck for a party! We know of one person who rented a truck but it showed up two hours late (however the food was great). In another instance, the person arranging the truck was text messaged at 1am the night before the event and told the truck could not come. In our experience, your best bet is to check with Quicho at Taco Nazo we know from experience that Taco Nazo can bake a tasty cake and cater with short notice. In April of 2010, Taco Nazo catered a book signing by Rick Bayless at North Market. Taco Nazo was a hit with Rick, so it may be a hit for you too. Junior’s Tacos (Carlos) has catered some events and has a second truck just for that purpose. Loyal Taco Truck Columbus fan has reported Rincon Latino did a great job for a private party. (April 2010) Some of trucks such as Las Delicas II have seafood dishes. However currently, we know of no trucks that do Baja style fish tacos. Do I need to speak Spanish to order at a Taco Truck? The level of English proficiency varies by the day and by the truck. We have been able to order at each truck using just English – but limited Spanish skills are helpful to better explore menus and build rapport with the truck owners and employees. We have a list of common phrases on this site – print them out and take them with you. Do Taco Trucks take credit cards or checks? No. Take cash, small bills if you can. (There is one exception – Taqueria Davanne started taking credit cards in early 2010 but we do not know how smooth the process is. There is a ATM near that truck as a back up). I am confused by a term used in Taco Trucks Columbus. ……You say pupusa; they say popusa; and I say something else. The taco trucks in Columbus come from many different regions in Mexico as well as El Salvador, The Dominican Republic, Columbia and elsewhere. Just as is the case for the United States (East Coast vs. Southern English, Ya All), Australia, and the United Kingdom, not all words and terms are created equal or are equivalent. We have tried to give the Hungry Woolf the boot many times – but in turn she just locks us in the trunk until we “agree” to order offal on the next 10 tacos. Vive la difference amigos. We use the terms that are listed on the taco trucks menus in Columbus and write based on the owners descriptions as well as our interviews with them. A baffled Taco Trucks Columbus visitor was offput by some terminology we listed. The discourse below is an example of the culinary terminology challenges we all face. buche is not stomach, but the throat part. Buche – depends on who you’re talking to. Stomach, throat muscle, and apparently even the craw of the cow are all called buche, there seems to be a lot of regional variation. The operators of the trucks we’ve talked to around here translate it as stomach when explaining it to us. From what we’ve read, this is typical in LA as well. Our experiences with and writings about pupusas are solely related to Columbus area vendors (and for readers of this Columbus area blog), so if someone of Salvadorean background calls them ‘popusas’ here, who are we to judge? Interestingly, when you google ‘popusa’ there are plenty of places where that spelling comes up on Spanish language web pages. It is perhaps not the dominant spelling, but never say never, eh? Regarding cabeza – I have no doubt that the preparation you describe is a variation that exists, but I don’t believe that that’s necessarily the only preparation. With that said, your post does make a useful point. The definitions we’ve provided should be regarded as a general primer/guide and not as definitive. We generally encourage people to try new things first and ask about them later, but if you need to know exactly what you’re getting, you’ll only know for sure if you ask the people preparing the food. How do you make a living doing this web site? This site is not a business. Taco Trucks of Columbus is a labor of love, not profit. We sell T-shirts due to requests from our readers and receive a small amount for each sale which is enough to buy two tacos per month. How much a taco truck cost or how much you can rent it per month? I want to start and run a taco truck. Mahaveer – Honestly, we have no idea. Most (though not all) of these trucks appear to have been purchased second-hand, so I’d guess the cost varies considerably. I would recommend speaking to some of the taco truck owners themselves about it. We will keep an ear out, and if we hear of anything we’ll let you know. Thank you, would love to hear if you get to know any info..
Where can I buy a taco truck in Ohio? Please help me get started. There is no good clearing house for Taco Trucks but you might want to inquire about the Taco Trailers stored on Cleveland Ave., take a look at our Ghost Truck post. I spoke with the owner of a taco truck about this, and they suggested looking in the classified section (ads) in either Fronteras or Voz Hispana. You might also consider talking to some of the truck owners themselves – they tend to know what’s on the market before it hits the local newspapers. Know of any vendors selling quinoa tacos (a la Mas Tacos in Nashville — http://www.yelp.com/biz/mas-tacos-por-favor-east-nashville ) ? If it’s not a Mexican specialty but more of a fusion dish, I’d consider talking to Junior’s – they seem fairly receptive to new ideas and seem more willing than most to shape their menu around their customer’s interests. Looking for Tamales, do you know which trucks have them? There are quite a few that have them – Junior’s, El Manantial, Los Potosinos, Taqueria Davanne, Taquikin, Taco Nazo and Otro Rollo just to name a few. Not all of them have them all of the time, though, so If you have your heart set on tamales I’d recommend giving your preferred truck a call ahead of time. Why don’t you guys and gals put up some reviews on Yelp.com? Taco trucks are an integral part of C-bus’ dining scene, but still under the radar. I’m pretty sure we are the Taco Truck Capital of Ohio. I certainly would encourage all of our readers to add their favorite trucks to Yelp. Guys and Woolf to clarify: Columbus is the undisputed Taco Truck Capital of the Midwest. Cleveland – 0, Cincinnati – three gringo taco trucks, New Carlisle -1?. There are a couple trucks on Yelp. Seems to be this is a better one stop shop of taconess and the only place that does cool tours. Help. My fiance’ has a dream of our wedding celebration being in an airplane hanger on a Saturday night in August with a great band and drinks and at least 1 taco truck to serve food for 200 – 300 people. We are still working on the location and I am hoping there is a taco truck owner who sees this and is intersted in a great oportunity. Bill – Congrats, and what a great idea to have a taco truck at your celebration. You may not get much response from this website, though… from what I’ve learned in talking with truck owners, most of them don’t spend much time on the internet. I’d consider giving a few of them a call. I believe that Taco Nazo and Taqueria Jalisco have done catering before, and I think Los Guachos has mentioned being able to do it as well. Might be a few worth calling, at least for starters. I don’t know if it is feasible, but could trucks be listed by country of origin? Here’s why I ask. A few years ago at the Cols Latin Festival, I fell in love with Colombian Tamales. I know Colombians don’t even call them tamales, but they are wonderful. Any idea where I can get such a thing on a regular basis? It probably isn’t feasible to list country of origin, because all of the trucks (35 and counting) except for two of them serve Mexican food. Luckily for you, the other trucks are Colombian, and if I recall correctly, the owner of El Manantial (corner of Lane & High) told us she served tamales at the Latin Festival a few years ago. The other Colombian truck is 8th Taste, and we haven’t verified whether or not they’re still open (or re-opened) after the winter. (Re: The 8th Taste) They are back in business. They’ll be opening monday- saturday at 10:00-ish. Breakfast tacos?? I’m from Texas and I’m addicated to breakfast tacos. Do any of these taco shacks serve them or does anybody know where I can find a decent one in columbus I’m in serious withdrawl. I don’t think any of the trucks specifically have them on the menu – but most have eggs as an option on a torta so they could probably make them for you. Not a truck – but Cafe Corner in Victorian Village (third ave) has really popular breakfast tacos. The restaurant Cuco’s on Henderson road has very respectable breakfast fare. I work for the State of Ohio on the east side, just south of the runway at Port Columbus (5th avenue). There are 600+ white collar workers in our building, and another 1,000 office workers across the parking lot. There are no conveniently located Mexican restaurants in the area. What are the chances of one of these trucks making a weekly stop at our facility for lunch? There is a Taco Truck very near your office if you want to make a dash on your own – El Tacorriendo is just across from the VA. With business slow in the winter, you can give Juniors a call and see if they can send their second truck out to you.